The earliest Colonial roads were merely narrow paths and trails carved into terrain that was difficult to traverse, and those in marshy areas were especially bumpy, whether due to natural tree roots or because the man-made roads were reinforced with logs to minimize the risk of wagon wheels or horses becoming mired in mud. They were dubbed "corduroy" roads because the positioning of the logs side by side perpendicular to the direction of travel resembled the wide wales of course woolen fabric called corduroy. Such roads date back to 4,000 BC with examples found in the bogs of England and Ireland, and the road-building method was adopted by Colonial Americans, including early inhabitants of Fairfield, according to Cece Saunders, a founder and principal of the Westport-based Historical Perspectives, a cultural resources consulting firm that conducts archival research and archaeological reconnaissance surveys. Fairfield's historic corduroy road appears to be the oldest remaining example of a preserved wooden road in the state, Saunders said. The rough-ribbed road was constructed about 1750 and is one of only two known surviving examples of 18th Century corduroy roads still in existence in Connecticut. The other rests beneath salt marsh peat in Guilford. Saunders said the local archaeological site survives as a remnant of a colonial road system that was crucial to the early development of Fairfield and other coastal towns and river settlements. "The corduroy road was essential for establishing networks between communities and critical resources during the 17th and 18th centuries in New England," Saunders said. They also served a purpose in other parts of the nation. General George Washington's Revolutionary War troops built corduroy roads as a shortcut from New Jersey to New Windsor, N.Y., to move large numbers of men and supplies more quickly. And they also were used extensively during the Civil War in General William Tecumseh Sherman's March through the Carolinas and Georgia, she said. In Fairfield, the corduroy road provided a valuable link between a grist mill at water's edge constructed by Peter Penfield and the center of town. "It's fascinating because it's part of Penfield family history," said Rob Wallace, a volunteer at the Fairfield Museum and History Center. Fairfield's corduroy road originated at Ash Creek, a salt marsh estuary at the mouth of the Rooster River and in Long Island Sound between Bridgeport and Fairfield near the Great Salt Marsh Island Preserve. The creek gives up its secret on occasion. A relatively intact 53-foot section of this road is visible when the water level is down. "Part of the soil has eroded so the ribs are exposed," Saunders said. "The best time to appreciate it is low, low tide. You won't be able to see it at high tide." The log road rests approximately 24 inches below grade, she said. "Logs, with bark still attached in many cases, appear to be composed of local species (for example, oak, maple and black birch) from 4 to 6 inches in diameter with larger logs split lengthwise," Saunders said. At first glance, the logs could be mistaken for the remnants of an old fort because they give the appearance of sticking out as if in a protective manner. But the logs are actually parallel to the water. Even back in the 1700s when the road was used to transport goods to and from the water's edge, part of the road would probably have been submerged at high tide, although not completely covered by water as it is now, Saunders said. "It always skirted the edge of the wetland. There may have been times when it wouldn't have been passable," she said. Wallace called the corduroy road one of the town's "historic little treasures." "It's a treasure to be appreciated from a distance," said Saunders, who was instrumental in getting the local corduroy road designated as a State Archeological Preserve in 2009. Such preserves were established by the state legislature to protect significant archaeological sites. Through the cooperation of the Connecticut State Historic Preservation Office, the town of Fairfield and the Aspetuck Land Trust, the Ash Creek corduroy road has also been listed on the State Register of Historic Places. Connecticut law prohibits excavation, damage or otherwise altering or defacing the archaeological integrity of such preserved areas. Significant penalties are in place for vandalism of such sites because the state recognizes their educational and cultural value. In an out-of-state presentation last year, Saunders talked about the historical and cultural significance of Fairfield's corduroy road. "The road and bridge linked an old Fairfield town road, the Penfield mill, with Balmforth Street and the community of Black Rock, a section of what is now Bridgeport. Balmforth Street is still on the city grid. 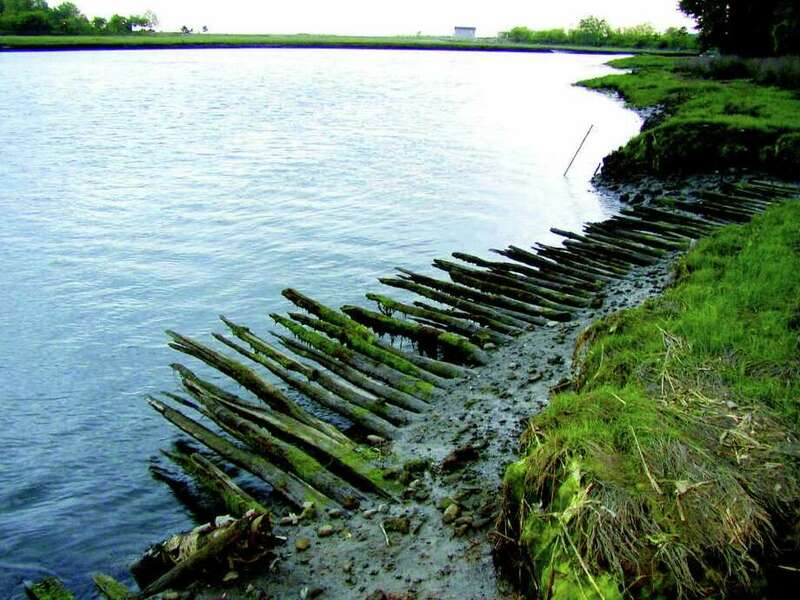 This access way not only allowed for the transport of raw materials and products to and from the mills, it provided a much needed shortcut across the Ash Creek from the colonial Fairfield town center to Black Rock Harbor," Saunders said during the lecture. "We know of other (corduroy roads) that were used. There was another discovered up in Tuxedo Park (New York) in the bottom of a lake because the area was subsequently dammed," Saunders said. The few remaining examples of this kind of road construction probably have been preserved by water or salt or both, she said. Water keeps oxygen away. Oxygen is what leads to decomposition, Saunders said. "We think the salt is helping preserve the one in Fairfield." "The fact it got buried in peat and swamp grass preserved the area there," Wallace said, and he hopes people will continue to preserve what nature has protected for almost 300 years. If historic homes and landmarks are torn down or replaced, the character of a town as well as an appreciation of local heritage, are lost, Wallace said. "One of our challenges is connecting people with the land and when you have a compelling archaeological road it tends to draw people in because of the history," said David Brant, executive director of Aspetuck Land Trust, a non-profit corporation devoted to preserving open space and the natural resources of Fairfield, Easton, Weston and Westport.